Eventually it will be important to transfer adult assistance to methods that will improve self-help for your child with homework. Remember that an important goal of homework is to develop independence and responsibility. Thus, the most important lesson to be learned from homework is how to complete it successfully the next time. Fostering independence is accomplished by moving your child from dependence on you to dependence on homework buddies and material resources (e.g., references, lists, reminders). Remember that focusing on what is right about your child is the best way to help him or her strengthen and develop homework completion skills. Although young children require your close observation, support, and your ability to identify their work style and preferences, eventually you must provide your child with opportunities for decision making, planning, and goal setting. This is particularly important to achieve prior to the adolescent years when there is a more delicate balance between assistance and interference. As we have written in previous columns, during the elementary years, perhaps even more important than the goal of practice and rehearsal, homework helps your child develop the skills necessary to become an independent learner. Independent learning is a critically important skill for middle, high school and college success. By laying this important foundation you and your teen will be prepared when he or she expresses a preference to work alone and your assistance may be perceived as an intrusion. 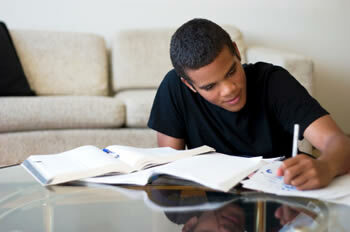 Many teenagers find parent help with homework an unwelcome offer. By the late elementary school years your involvement may be most effective when it is defined as awareness and monitoring, rather than direct assistance or physical supervision. By the middle school years homework should be completed independently. You should act as a consultant and information source rather than a task master or supervisor. Forcing your assistance on your child at any age will only result in conflict and reduced motivation.